Fluffy 100% whole grain Vegan Lemon Blueberry Muffins bursting with bright lemon flavor! Moist, healthy, irresistible muffins the whole family will love. Is it just me or has the Hummusapien baked good game been ON POINT lately?! The recipe bug has clearly bitten me good and it’s been super fun to have those creative juices flowing. Believe me when I say I feel it physically when that inspired spirit flows through me like liquid gold. It’s magic. But I also go through phases of writer’s block (and recipe block) when I feel like I legitimately have nothing to say or give to the world, which as a blogger, can be a challenge. Instead of judging myself for wanting to hibernate here and there, I sit with it, I let myself feel it, and I do something else that has nothing to do with food or nutrition or the internet. I listen to 90’s music. I sit outside at a coffee shop and listen to the birds. I walk to the park with a friend. I call my mom. I have real, meaningful, in-person conversations. I CONNECT. With myself especially but also with the people I love most. You know what else brings me joy in moments when joy is tough to find? Baking. Baking something yummy in the kitchen by myself when it’s really sunny out while I jam to Betty Who. 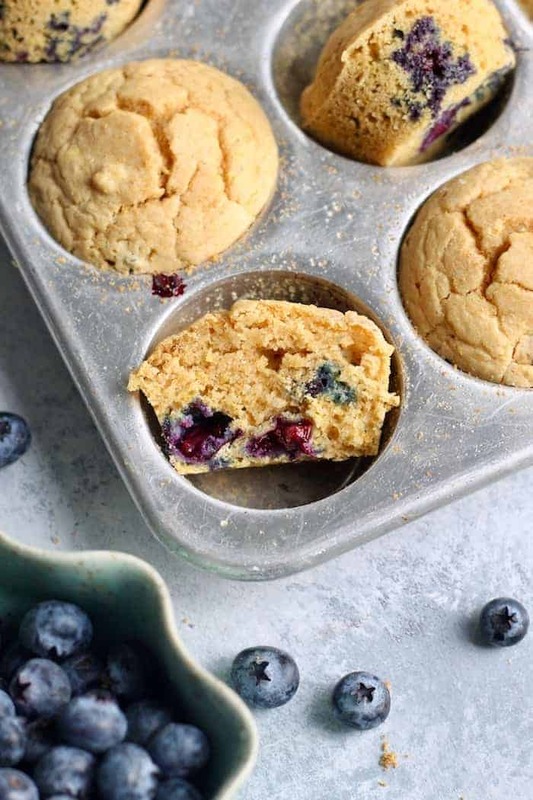 When I think of these stellar healthy vegan Lemon Blueberry Muffins, AKA fluffy clouds of delish muffin heaven, I think of the warm and fuzzy feeling I had when I was whisking the flour and zesting the lemon. I really believe that food tastes better when it’s made with love. 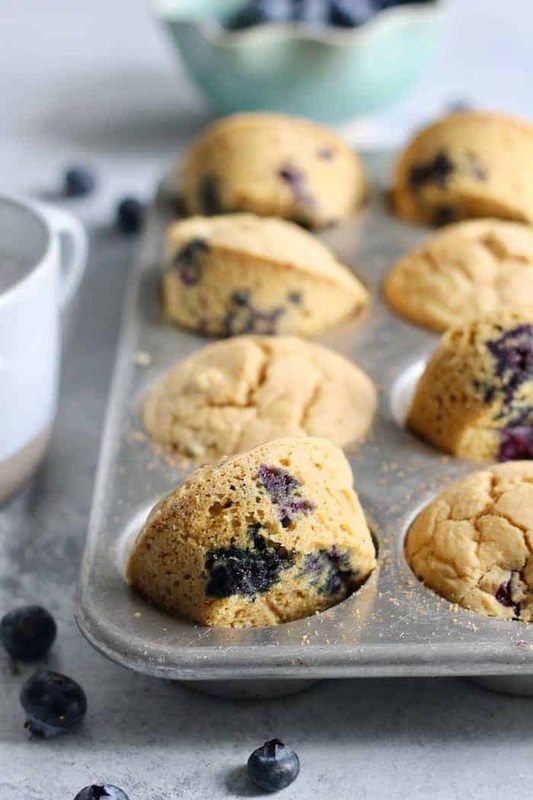 100% Whole Grain Fluffy Lemon Blueberry Muffins–a Simple Recipe that Won’t Disappoint! These vegan muffins are made with ALL THE LOVE. They’re 100% whole grain (whole wheat pastry flour is my spirit animal), vegan, bursting with bright citrus flavor and sweet bloobs, and so darn moist n’ fluffy that you may just never make another muffin recipe again. They’re egg free and come together in minutes! First you’ll make a vegan “buttermilk” by curdling almond milk and lemon. So easy. Melted coconut oil makes them super buttery with a nice crumb. They rise beautifully thanks to baking them at 400°F and having plenty of flour. No flat, dense muffins here! How awesome is this muffin tin with a lid? Great for traveling. I use this muffin tin at home and it’s foolproof. I often use these silicone muffin liners as well when I don’t feel like cleaning the pan. These cooling racks are a must! This muffin scoop may just save your life. So much less mess! Jeff and I polished off this batch in less than four days and I couldn’t wait to make them again. I think you’ll appreciate how quickly they came together and how awesome they taste for being so wholesome. Muffin on, good souls! 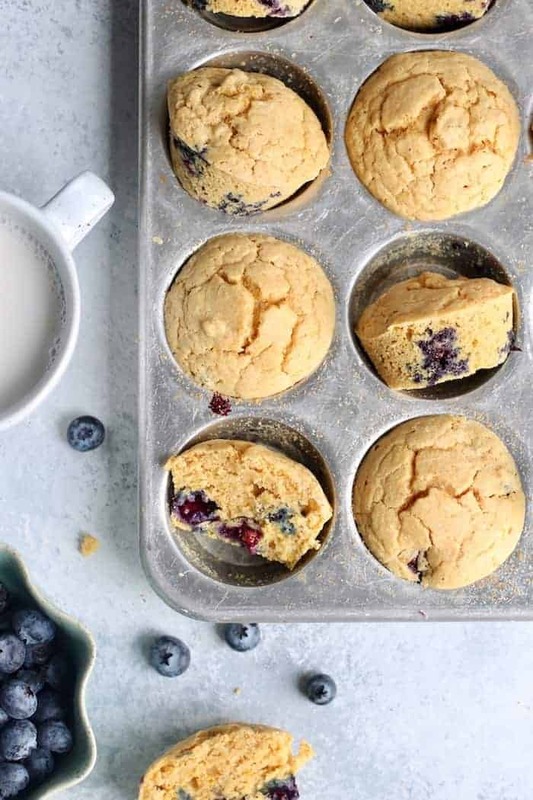 Please let me know how this fluffy lemon blueberry muffins recipe turns out for you by leaving a star rating and/or comment! I hope you’re as obsessed as I am. Delicious, fluffy, 100% whole grain + vegan Lemon Blueberry Muffins bursting with bright lemon flavor! Moist, healthy, irresistible muffins the whole family will love. Preheat the oven to 400°F. Lightly grease a muffin tin. Place almond milk in a liquid measuring cup or bowl and stir in lemon juice. Set aside. Measure flour by spooning it into measuring cup and leveling with a knife, being careful not to pack it in. Place flour, sugar, baking powder, baking soda, and salt in a medium bowl, stirring to combine. Stir in lemon zest and blueberries. Stir oil and vanilla into almond milk mixture. Pour into the dry ingredients, stirring just until combined, being careful not to over-mix. Spoon batter into the prepared muffin cups, filling them to the top. Bake for 18 to 20 minutes, until a fork comes out clean. Cool muffins in tin for 10 minutes before transferring to a wire rack to cool. Store leftover muffins in an air-tight container on the counter. For a gluten-free version, I recommend this 1:1 all purpose baking flour. Almond or coconut flour will not work as a substitute. These will be on my Easter Brunch buffet table for sure! Thank you for the vegan recipes that I can count on everyone enjoying. Sure makes my job as “holiday hostess” easier! Yayyy I love the sound of that, Lisa! Hello! I don’t have pastry flour… would I be able to sub whole wheat flour instead? If so, would it be the same ratio? Thank you, Alexis! Yes you can use that! I have been on a big banana muffin kick but decided to make these because I had all the ingredients on hand and OMG I just wish I’d tried this recipe sooner. Can’t wait to make them again! Awwww best news ever!! Thanks so much for letting me know, Erin! !